I’ll almost bet on the fact that you chose WordPress to propel your website at least partly for its ease of use. This is not the only advantage, but it must be said that its installation, its setting and its handling make it a tool that we love right away. You are in the starting blocks to launch your website project. But here you go, your project is also a multilingual project. The least we can say is that WordPress does not know how to manage your type of project without the help of a good dose of technical knowledge. Unless you use the right WordPress plugin translation. 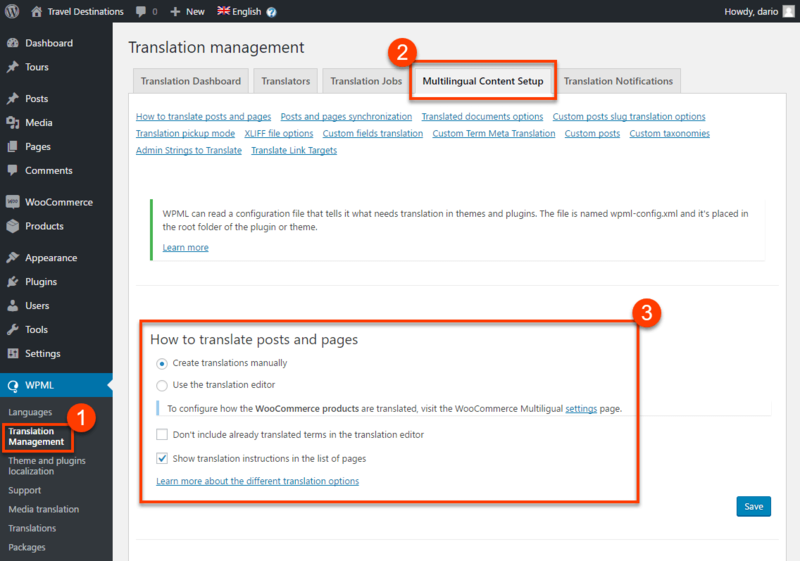 Discover in this step-by-step guide, how to translate your WordPress site without any difficulty thanks to the wonderful plugin system built into WordPress. There are many WordPress translation plugins . But not all are equal, far from it. Depending on the level of integration and support of third-party functions that you want to have at the multilingual WordPress, one plugin will be better than another. It may seem surprising to talk about WooCommerce here. After all, we’re talking more about a plugin than WordPress. We suggest you to read this guide right away because with 75% of the installations of new eCommerce sites which are WooCommerce, it is a bet that you will quickly ask you the question of the support of WooCommerce by the translation plugin which you will seek . For years, our choice is made concerning the translation plugin to always use during its WordPress projects: WPML . WPML is the plugin with the widest spectrum of features available in terms of WordPress translation plugin. He is able to adapt to all types of projects that we had to manage with him. From the eCommerce site to the SOAP system through sites with rich content and numbers of important languages (over 30 at the same time) and WPML has always lived up to our expectations. Check out WPML and there’s no doubt that you’ll be converted by this plugin that propels you more than 500,000 multilingual WordPress sites worldwide. The icing on the cake, WPML is undoubtedly the most multilingual WordPress plugin supported by other plugins and WordPress themes and by the WooCommerce themes and plugins . Ok so normally at this point you have WPML and have followed the plugin installation procedure. This installation is in step-by-step mode. This makes the whole accessible to the most profane. Trust does not exclude control, let’s take a moment to check that the installation of this WordPress translation plugin is well done. Go to Extensions & gt; Installed Extensions. You should see the WPML Mulitlingual CMS or WPML Multilingual Blog plugin enabled depending on your version. A number of add-ons accompany WPML. We talk about it in our guide WPML: The plugin in every detail. Depending on what you have chosen and activated, you will inevitably have a longer or shorter list. We usually use the WPML Translation Management modules to allow us to follow the translation level of our sites and the essential WPML Media, WPML Sticky links and WPML String Translation . Three plugins that we consider indispensable in the majority of the cases. The WPML Translation Analytics plugin is more rarely used for us. When the WPML WordPress translation plugin is installed, you should have noted the learning of a new entry in your WordPress: WPML admin menu. As you can imagine, we will find in this new entry all that will be needed to configure our new multilingual WordPress site. Clarification. Depending on how you manage the translations of all the contents of your WordPress site, you will also find in this menu access to the management interface dedicated to tracking translations. It is also through this interface that your content will be accessible to potential professional translators. A guarantee of security and more for your WordPress site. The basis of a multilingual site is to manage multiple languages of the site at the same time. WPML allows us to manage a very large number of languages on its website. 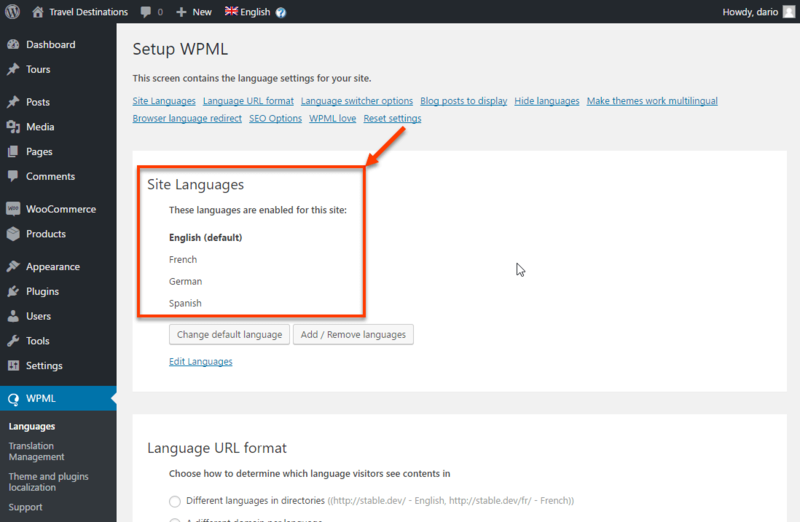 By going to the Languages sub-menu of WPML you can see the languages that are configured for your multilingual site. Write something interesting. The primary language of the site is English and not French as the primary language of the site. We strongly advise you to always do this for your multilingual projects with WPML. A guarantee of peace of mind. Now that your administration interface allows the complete management of a translated WordPress site in several languages, it is still necessary to allow your users to access this content available in their language. To do this, nothing better than to display a language coach on his website. With this WordPress translation plugin, it’s a breeze. 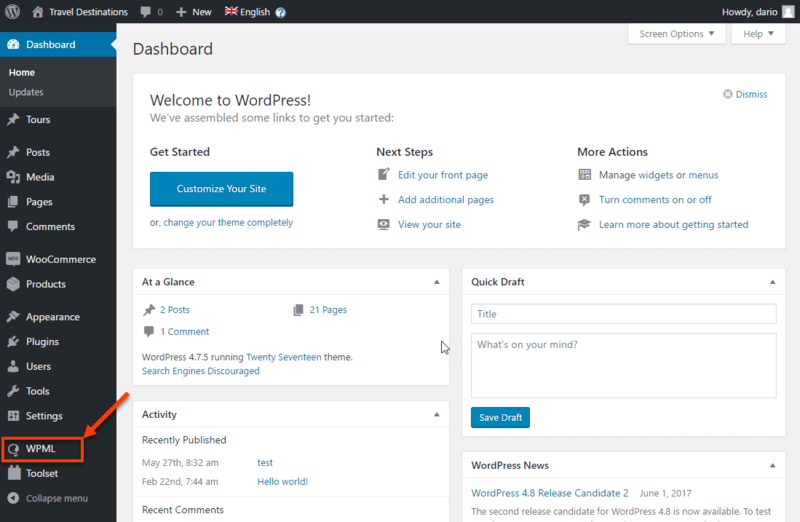 You have a multilingual WordPress theme , where you add the WPML widget to your sidebar. More than 75% of the topics on the market are compatible with WPML. 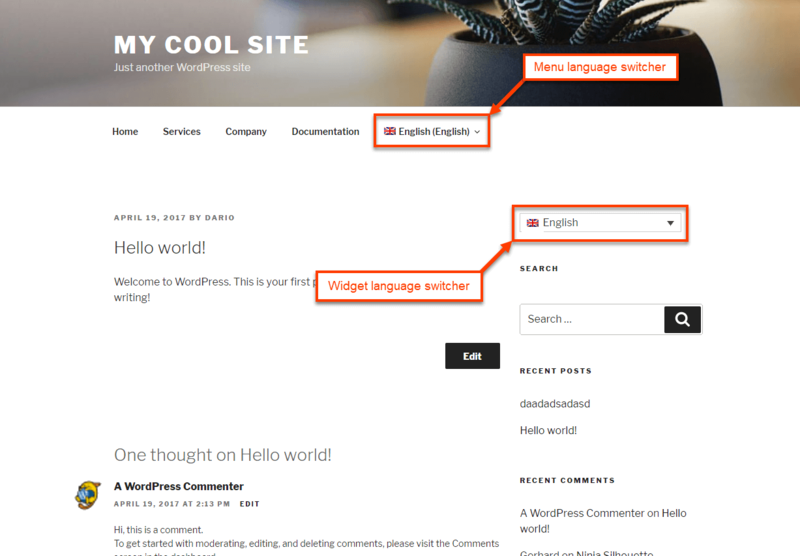 It’s a safe bet that simply enabling the language selector function will make it visible on your WordPress site. During its configuration, WPML offers you a default behavior to have with translations. Show the existence of translated content in another language only when that content is really available in other languages. In other words, you must consult a page with translations to see the language selector appear. For sites that have very few pages to translate, the management built into the editor of pages and tickets of WordPress is more than enough. However, it quickly shows its limits when you have to translate hundreds of pages into three, four or five languages. It would be a real hell, not to mention the fact that a translation may have states different from other content such as being translated for example. In short, having access to an interface that only deals with the advancement part of translations quickly turns out to be of great importance. WPML offers us the Translation Management module that will allow you to carry out this crucial task of having perfect control over your translations. Voila, you have everything to translate your WordPress site. once the right plugin is chosen, the job can become quite simple. Before concluding, let’s talk for a second about a special case: WordPress sites using page builders. This has become commonplace in recent years. For some projects, it’s a real plus to have access to more complex WordPress layouts, but still easy to use. However, this raises the question of multilingual management in such cases. WPML offers to solve this problem by going to the tab Multilingual Content Setup and check Use the translation editor. This will allow to have a real multilingual site even with a WordPress page builder. When you think about it, what is more complex in setting up a multilingual WordPress site is the choice of the right translation plugin. The choice is vast, and we do not hide our clearly marked choice for WPML. After years of use in many different projects, he has always been up to it. The main defect of WPML is its handling which, at first sight, may seem complex. Problem solved with the blog version of the latter, which will be your best friend in the case of implementing a single bilingual site that will require less functionality by definition.